Superintendent Brian Johnson explains the work that’s nearly completed on the entrance to the Southeast Valley High School in Gowrie. The vestibule and brick addition here are all new, providing more security and energy efficiency for the building. 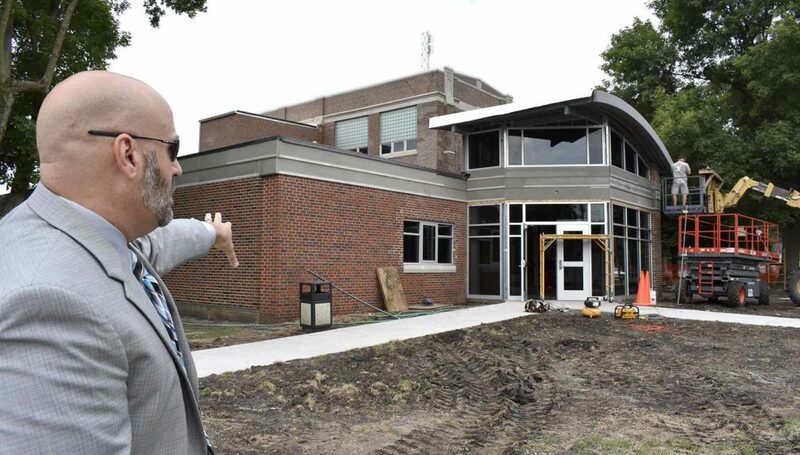 Superintendent Brian Johnson shows where the entrance door used to be at the Southeast Valley High School. This hallway was once an outdoor walkway. This door will be locked, requiring visitors to enter through the principal’s office at left. Ruth Nellis teaches her English 1 class in one of the recently remodeled classrooms. In addition to a new air conditioning system, the rooms have new paint and carpet. The new principal’s office at the high school is on its way to completion, as the old office has been converted into a classroom. Visitors will now have to pass through the office before entering the school. 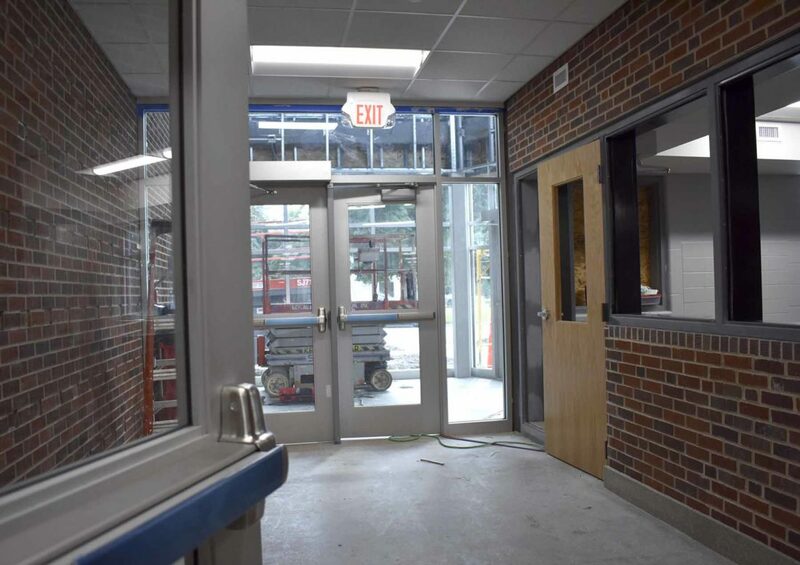 The vestibule and new entryway is under construction at the Southeast Valley High School. This door in the foreground will allow people out, but will be locked to visitors, who will enter through the office at right. 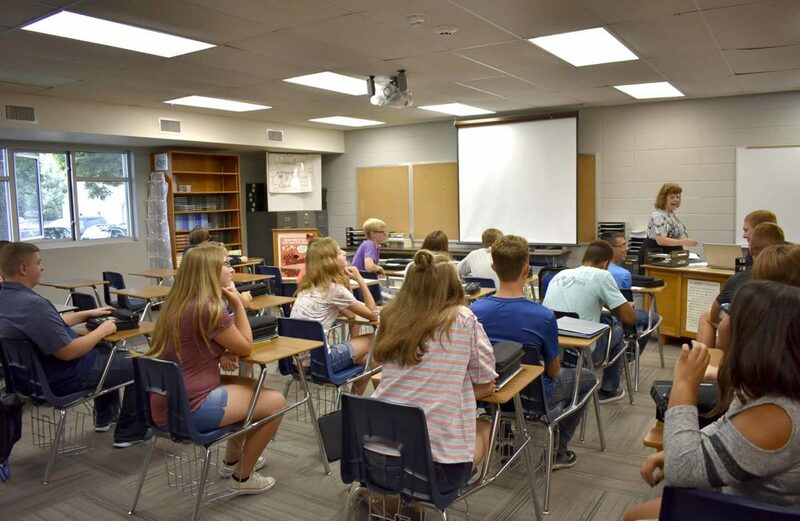 GOWRIE — School is in session again, and for students at Southeast Valley High School, it looks a little bit different. 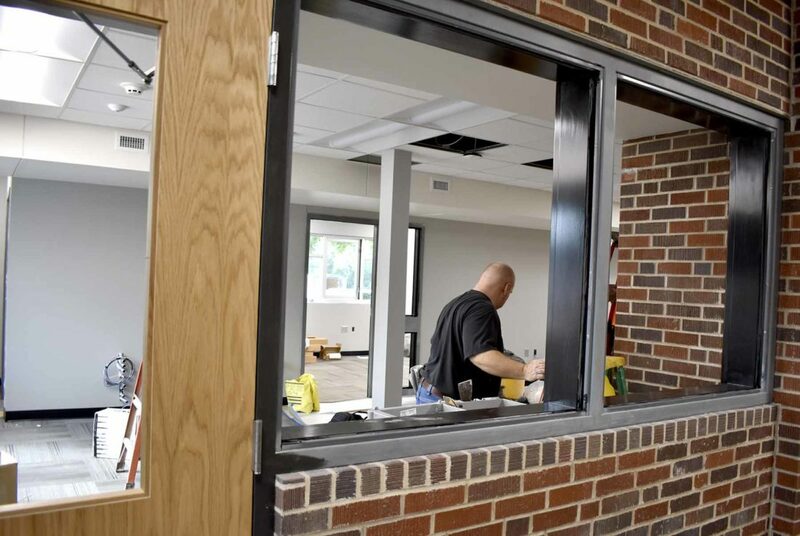 A brand new vestibule is in place at the entrance to the Gowrie school building, with workers still busy around the inside and out, completing the project. 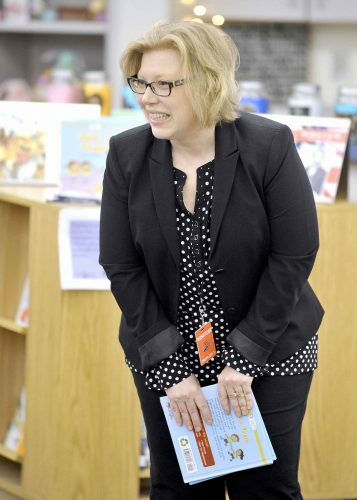 It’s the most visible aspect of a roughly $1.8 million remodeling project which is nearing completion, Superintendent Brian Johnson said. “This was all about efficiency and security,” Johnson said. 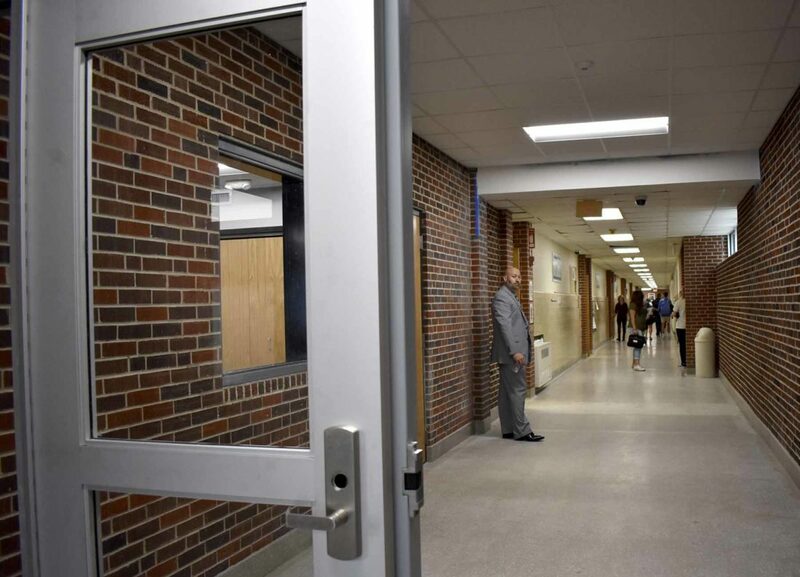 The new entryway doesn’t just look nice — it adds a significant layer of security to the school. Now, to get into the school, visitors will have to walk through the principal’s office first. Johnson showed the place along the brick wall where the “doorbell” used to be. That spot is now indoors, after a new portion of hallway was built along what was once an outdoor walkway. The high school principal and staff also have a new office, and the former office has become a classroom. All the classrooms along that south wall have new carpet, and new air conditioning/heating units which should be more efficient. The work was done by Kolacia Construction, with design by FEH Design Architecture. Subcontractors include Drees for plumbing, and Winger for electrical, Johnson said. “We’re happy to have a lot of local companies,” he said. One wall that was black board before has now been made into brick facade, Johnson said; and along the top of the wing, old glass is being replaced with vinyl signage. Once this work is done, windows are going to be replaced throughout older sections of the building, further improving efficiency, Johnson said. Initially the hope was to complete work by Thursday, he said. Work has also been done on the concession stand, to better serve both local and out-of-town visitors during athletic events. Meanwhile, Johnson and the district staff have settled into their new offices downtown, in what was once the Macke Motors building. The main showroom near the entrance is now a conference room. Eventually the former shop area there will be a new bus barn. 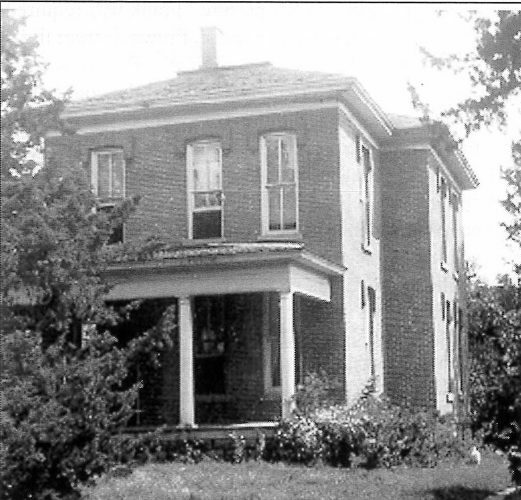 The school board approved the remodeling project in March this year. 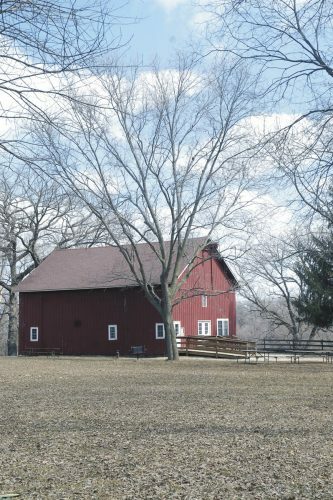 It had rejected plans for a remodel the year before after the only bid came in too high.